Opening and closing positions in a stock for the same trading day is meant as Intraday trading. The intraday trader is well known as a stock trader but investing and intraday trading is different though there motive is to get the high return tenets to apply is different. Intraday trading is buying a stock and sell it from 9 A.M. to 3 A.M. same days. Intraday Trading provides you much gain but at the same time, it is riskier too. If you want to perform Intraday Trading develop a trading psychology and know everything about the market. Intraday trading possesses the risk of losing partial or whole capital. 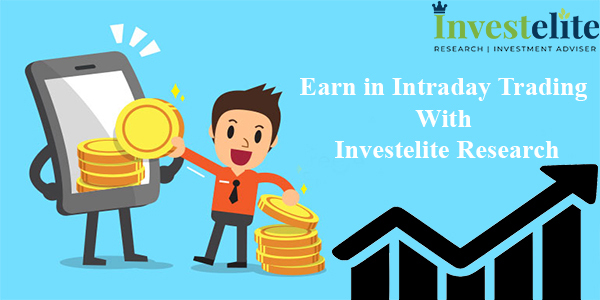 Those who are fresher and don’t have a lack of knowledge they can take the guidance of our certified analyst of Investelite Research so that they don’t get losses by trading themselves. Our experts at Investelite Research performs technical analysis to determine when conditions are the best to buy and sell. Investelite Research provides intraday recommendations signals to our clients such as stock future tips, best nifty intraday tips in a pack of value, growth, and prime. We provide best intraday day tips so as should not look carry forward for the next day. We believe to “Earn in your brain before you earn in reality”. 1. Invest what you can afford to lose: As Intraday trading comes with high-risk trading and investment can be vanished within a minute if you are playing in a wrong direction. The trick is you buy the lowest price at right and sell with maximum percentage profit in a few hours or just in a few minutes according to the fluctuation. 2. Research watch lists: Watch a list is a crucial tool in Intraday trading and our experts of Investelite Research keep the eye on focus. As day trading is a different game with a different rule. Everyday market changes its behaviour so we believe to set a goal, make a plan, get to work, stick to it and reach the goal. 3. Stop losses: Stop loss is the most important rule of Professional Trading and it’s A MUST FOLLOW principal. It contains a huge impact, in case of prices of shares move unexpectedly. .Investelite Research guides us to strictly follow stop loss no matters what so happens. whoever says, predict and influences you. 4. Choose high liquidity: It is a key and intraday traders must sell off their positions for the same day. It is a major key in Intraday Trading.”Square off your trade on the same day”. 5. Fix price and target levels: One should be fixed in his targets for the day. Intraday trading should be 2 or 3 scripts a day. Not more than that is needed to monitor the stock movements so closely. Also one should not do emotional reactions to it. The above mentioned are the tenents that to perform intraday trading. “A trading plan is just words until you act on it“.Just because the market is open does not mean you have to trade, cash is a position too. That’s why we Investelite Research are here to give you each and every single detail about day trading for the stock trader as it requires a lot of understanding and discipline to trade for a day. “Go with what actually it is, not what you think it is”.